According to a scale* measuring youth in Grades 6, 8 and 10 reports of community support, there were differences in reported community support among Grade levels. 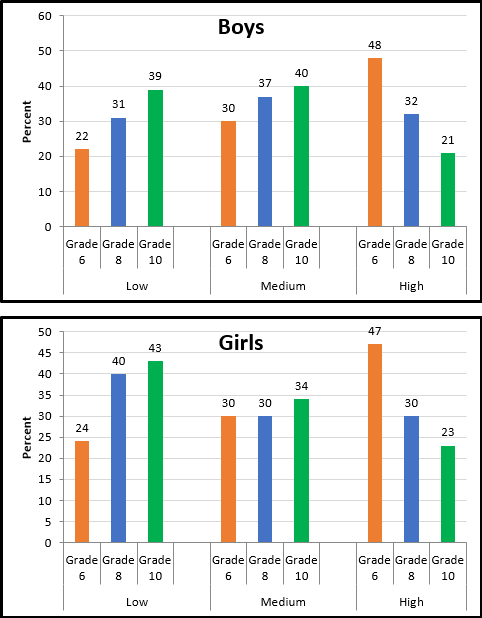 Grade 6 students were less likely to report having low levels of community support and more likely to report having high levels of support than were students in Grades 8 and 10. The reports were similar between boys and girls. People say ‘hello’ and often stop to talk to each other on the street. It is safe for younger children to play outside during the day. You can trust people around here. There are good places to spend your free time (e.g., recreation centres, parks, shopping centres). I could ask for help or a favour from neighbours. 1Vyncke, V., De Clercq, B., Stevens, V., Costongs, C., Barbareschi, G., Jónsson, S. H., Curvo, S. D., Kebza, V., Currie, C., & Maes, L. (2013). Does neighbourhood social capital aid in levelling the social gradient in the health and well-being of children and adolescents? A literature review. BMC Public Health, 13, 65. 2Morgan, A., & Haglund, B. J. A. (2009). Social capital does matter for adolescent health: Evidence from the English HBSC study. Health Promotion International 24(4), 363-372. 3McPherson, K., Kerr, S., McGee, E., Morgan, A., Cheater, F., McLean, J., & Egan, J. (2014). The association between social capital and mental health and behavioural problems in children and adolescents: An integrative systematic review, BMC Psychology, 2(1), 7.